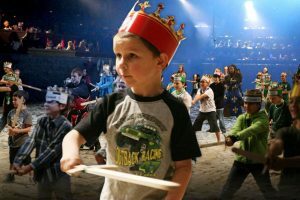 Did you know that Medieval Times is now offering special Junior Knights Training at the Dallas Castle over Spring Break? It is the perfect opportunity for your brave young knight to prepare for battles of imagination. Wondering what it includes? I’ve got the scoop. During Junior Knight Training Kids Will Enjoy: Watching an exclusive weapons demonstration by our Knights and Weapons Master, and learning about the grueling training it takes to become a Knight. Upon completion of their training your children will be knighted by her majesty Maria Isabella in a group knighting ceremony. ch child’s ticket. Children must be between the ages of 5 and 12 to participate. Space is limited and training is available on a first come first served basis. Training is open to both boys and girls. Closed toe shoes are required to participate. 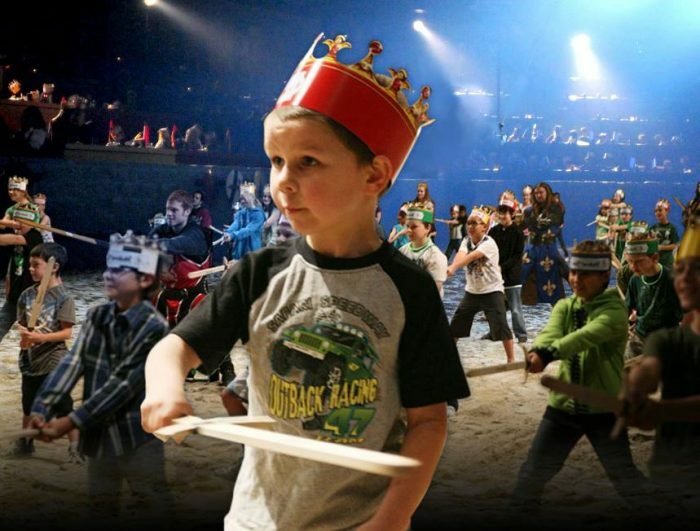 About Spring Break at Medieval Times: Experience The Excitement of Medieval Times this Spring Break. A Four-course feast awaits as you watch the pageantry and thrills of an authentic medieval tournament come to life inside the walls of the Queen’s 11th Century Style Castle. 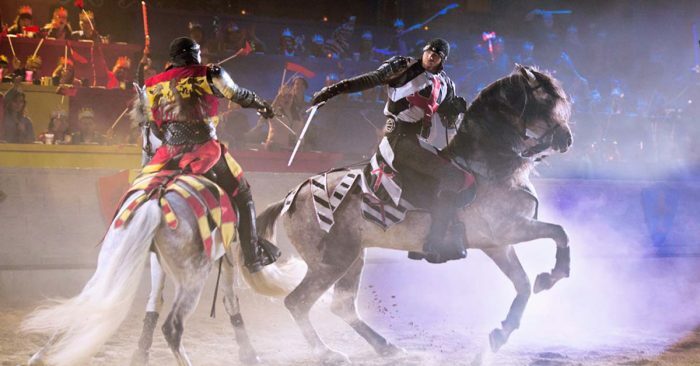 Six armor-clad Knights of the realm compete in thrilling games on horseback as the pageant unfolds and cheers of the Queen’s noble guests fill the arena. Skill and strength are measured in the combat. Discover which of the Knights shall become champion. 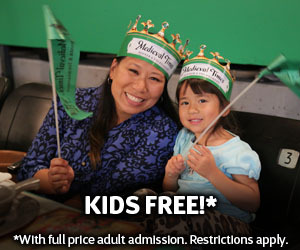 This offer is only valid at the Dallas castle, go to www.medievaltimes.com for offers at other locations. Summer days are long and hot in Texas, and we are always looking for a way to beat the heat and have fun as a family. 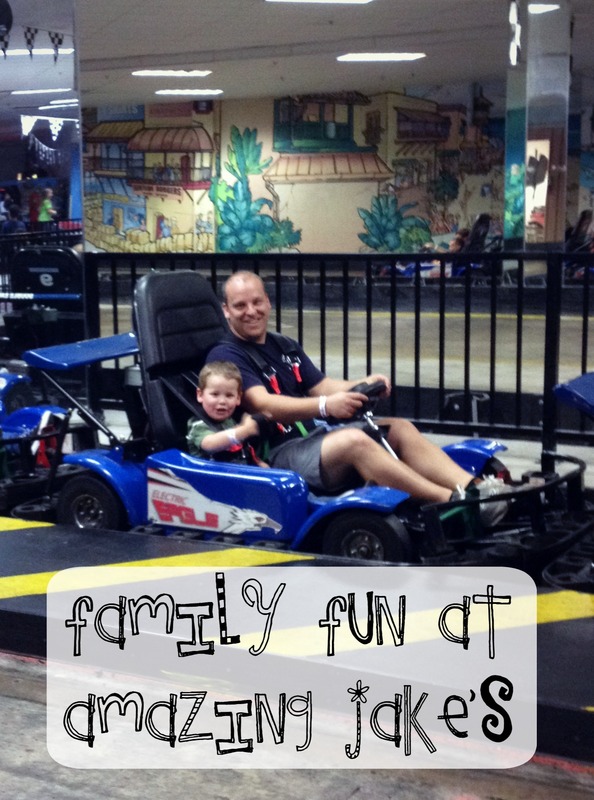 Recently we had the opportunity to visit Amazing Jake’s in Plano, and it was a blast for the whole family. Located close to 75/North Central Expressway in Collin Creek Mall, Amazing Jake’s is worth the drive from all over the metroplex. 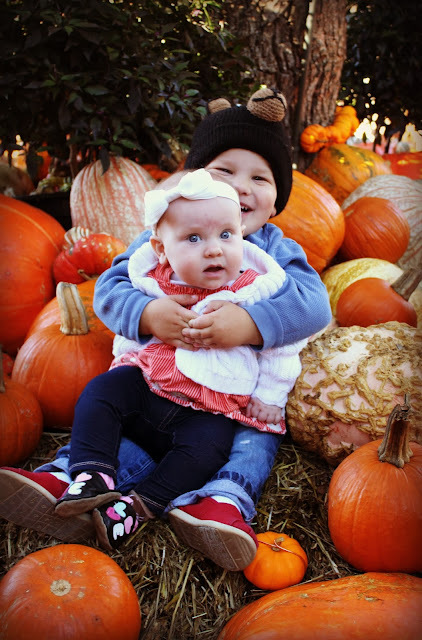 Read on to find what we thought about the entertainment at Amazing Jake’s for toddlers, preschoolers, and adults. American food and burger joints are often family friendly but can run the gamut from fast food to gourmet. 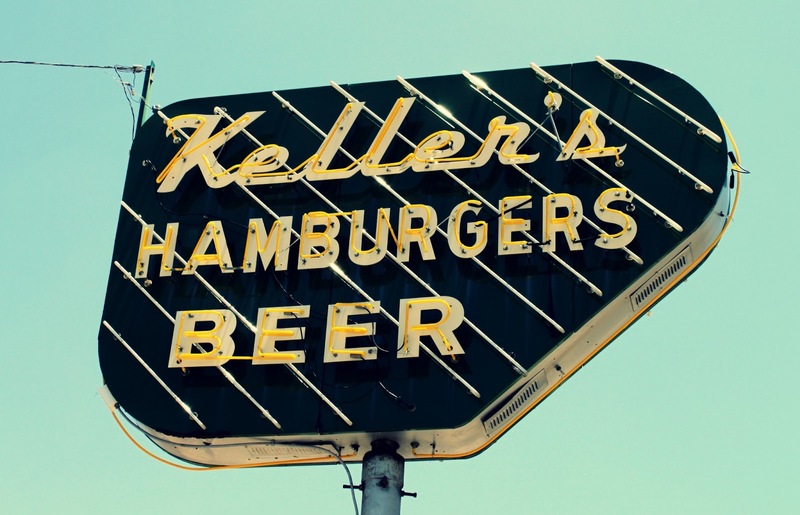 Here in Dallas there are a million options if you are craving a burger and fries, but some of them will break the bank. If you’ve read about our financial story, you know our dining out budget is TIGHT. This list will give you the top ten burger and American food restaurants where a couple can eat for under $20. At a few of them you can even feed a family of four for under $20. From plain jane to funky toppings, however you like your burger you will find great prices and quality food at all the restaurants on this list. Step away from the golden arches and head for one of the great options below. Pumpkins and pumpkin flavored things abound and the weather eventually cools down. It makes me want to be outside all day every day. My favorite pumpkin patch in DFW is the pumpkin village at the Dallas Arboretum. We were members for years when we lived close by, but now only visit on occasion. There are thousands of pumpkins and it is a festival of autumn delights. We took the Pearl girl for her first time and promptly plopped her in the Bear’s lap for a photo shoot. She was not sure what to make of the whole situation. The one below is my favorite so far. 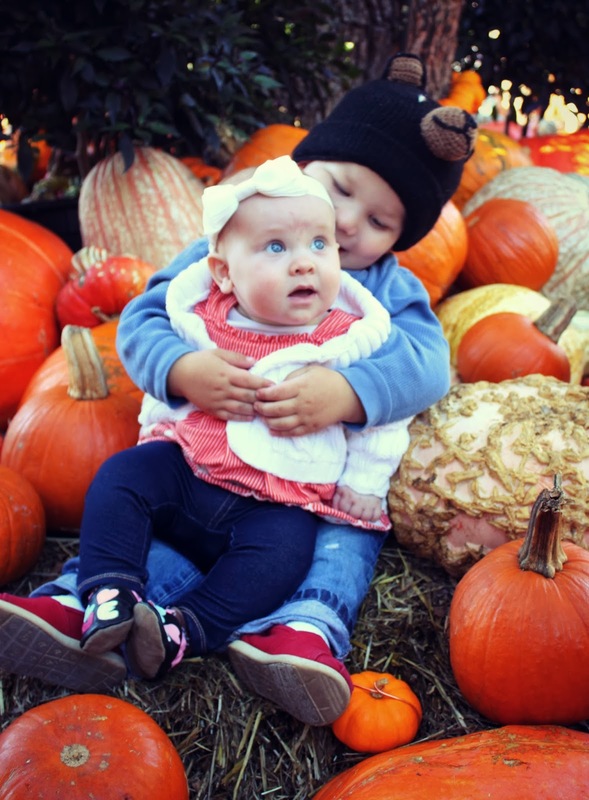 Her eyes are filled with wonder and he is hugging her so sweetly. It turned in to more of a headlock shortly after. We’ve got to work on the brother/sister pose. 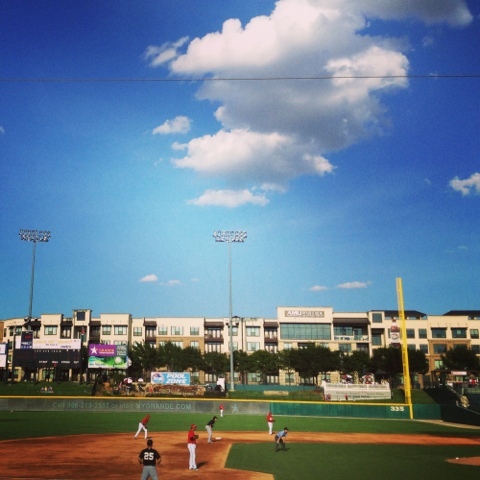 The DFW metroplex has so much to offer when it comes to watching sports live. My personal favorite is minor league baseball. Don’t get me wrong, I love watching the Rangers. 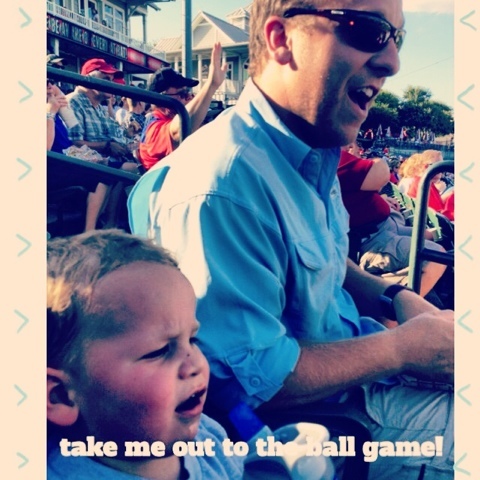 I prefer minor league baseball because it is amazing to watch the players pursue their dreams with passion and talent, and tickets are much more affordable. Many of them may never make the big show, but they work hard and spend countless nights on uncomfortable buses traveling endlessly around the south playing their hearts out. That kind of dream chasing is inspiring. 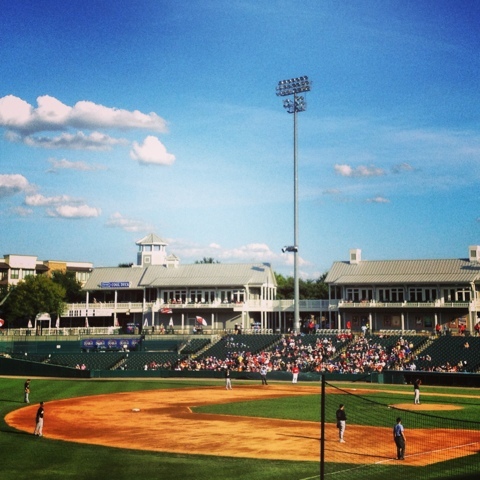 The Rough Riders are the AA farm team for the Texas Rangers. This means we have the unique opportunity to watch players develop and then see them play in the big leagues as well. It is so fun to see someone you’ve cheered for make their dreams come true when they get called up. On rare occasions we get to watch Rangers stars play close up when they are rehabing an injury. We had such an opportunity when we visited Dr. Pepper stadium, because Rangers pitcher Matt Harrison was on the mound. 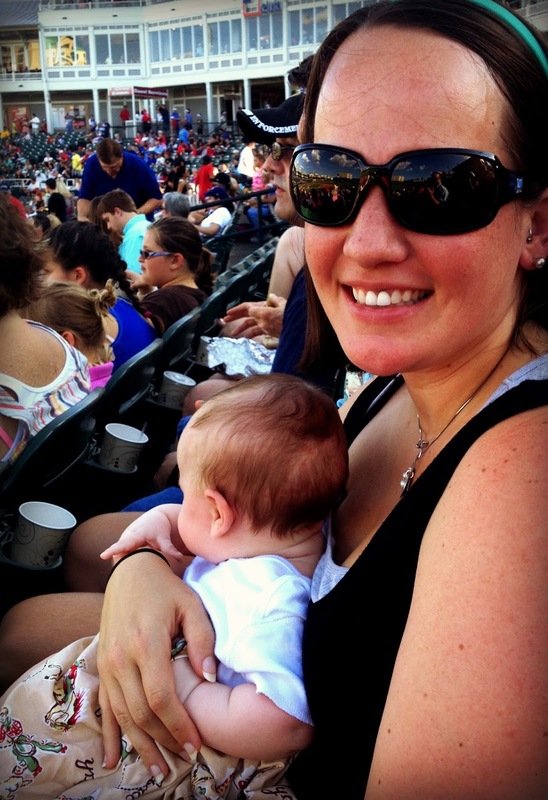 Here is the Pearl Girl at her first baseball game. Please note she is dressed in a cowgirl dress in honor of the home team mascot. The Bear loved his first game, though he didn’t make it all the way through. He has asked several times to watch baseball this past week. I grew up watching the Arkansas Travelers play with my parents and grandparents. My Grandmom and Grandad rarely missed a home game, and even had their picture featured in a Southern Living article on minor league parks. There is nothing like cheering on the home team with your family, and I hope this was the first of many games for us. 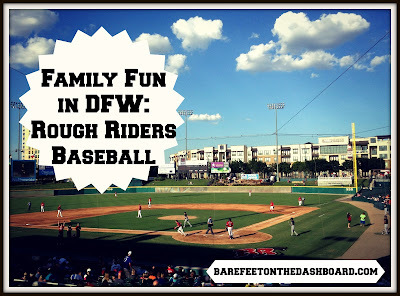 If you are interested in taking your family to watch the Rough Riders play in Frisco at Dr. Pepper Ballpark, you can buy tickets and get more information on their website here. There are still plenty of home games left this month, and the season starts again in April of 2014. The team offers fabulous season ticket packages to fit every budget as well as meal packages with unlimited food and drinks. Rough Rider season tickets are the perfect holiday gift for the baseball fans in your life. You can also follow the team on Facebook, Twitter, and Instagram. 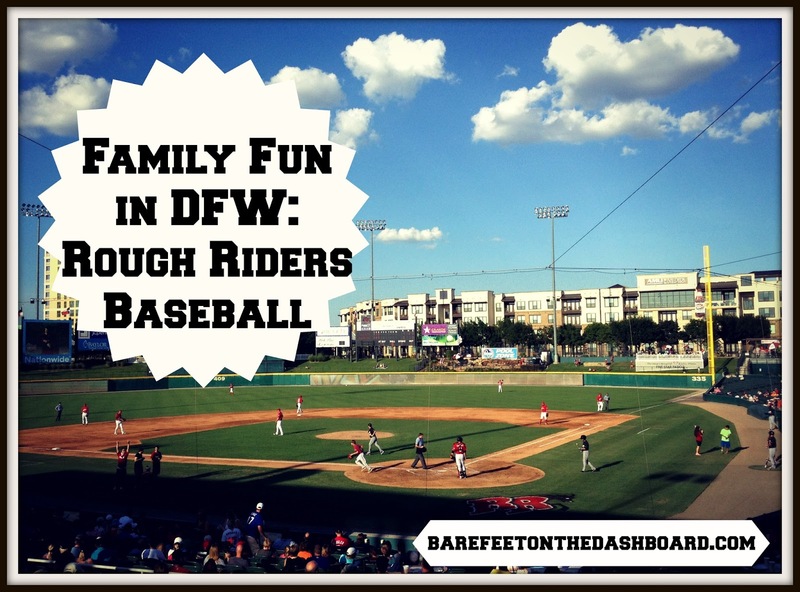 **Thanks so much to the Rough Riders organization for providing tickets for our family in exchange for this post. All opinions are strictly my own. What is your favorite sport to watch live? We are in the seriously-too-hot-to-live phase of Texas weather, and constantly trying to find ways to keep cool and entertain our family without spending too much or staying glued to the tv. 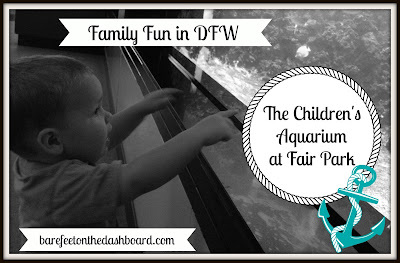 If you follow me on Instagram, you know that recently we visited the Children’s Aquarium at Fair Park in Dallas and had an absolute blast. We received free passes in exchange for this review, but all opinions are strictly my own. 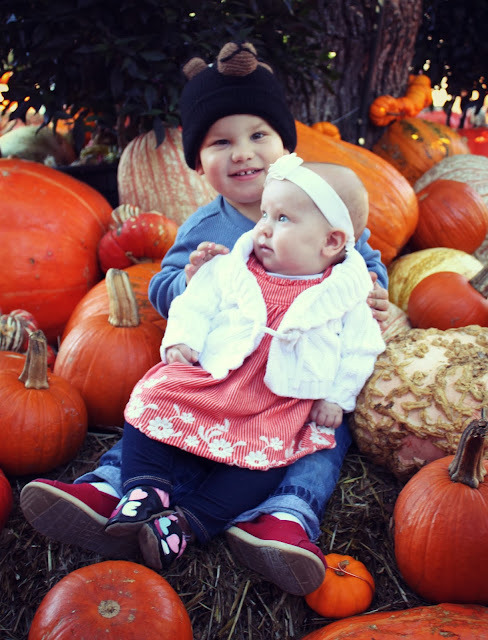 We love exploring the city we call home and enriching the lives of our wee ones on the way. 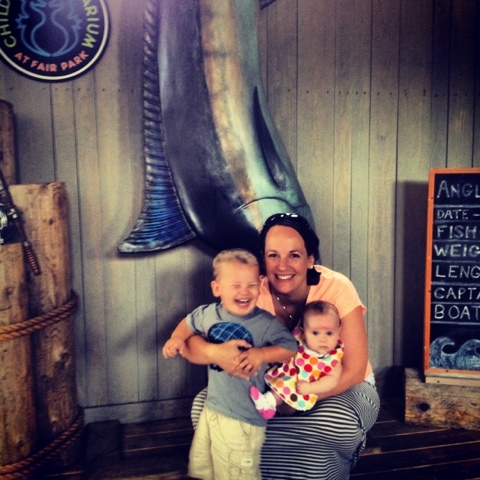 The Aquarium has been around for a long time, but was recently completely redesigned as a Children’s Aquarium. EVERYTHING is on a child’s level, completely accessible, and perfectly placed to grab their attention. Bear was enthralled. He has been talking about the alligator we saw for over a week now. 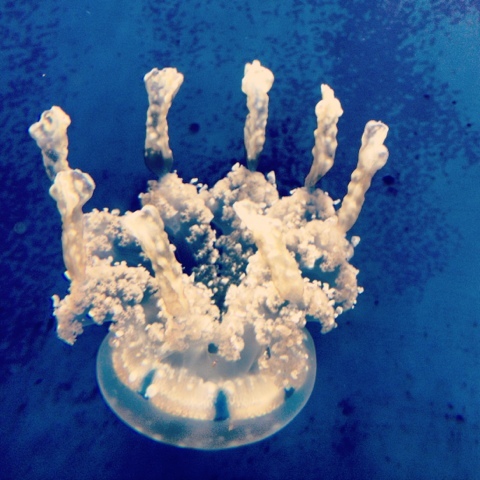 Isn’t this jelly fish amazing? There are two sides to the main aquarium, salt water and fresh, as well as a touch pool, shark tank, and stingray touch pool. Everything is included in the admission price except for stingray food (if you want to feed them) for and extra $2. Bear was a little intimidated by the stingrays, so we didn’t try feeding them. Spike wants to bite your toes. Thankfully thick glass protects you from this 190 pound 75 old year old titan snapping turtle. The jelly fish were truly beautiful to watch. They float so gracefully like aquatic ballerinas. It almost made me hate them a little less. I’ve been stung one too many times. The touch pool is surrounded by a step rock formation to make it the perfect height for every kid. The staff guide was so patient with Bear and showed him shells and sea urchins, helping him touch them gently. The outdoor shark and stingray tanks were fabulous. There are several different vantage points to watch the sharks, but this was my favorite as well as Bear’s. 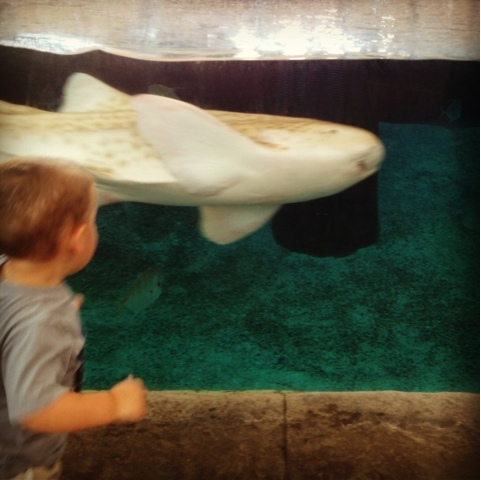 He waited for each shark to swim by and chased it down the glass. I couldn’t get a non-blurry photo, but it was such a fun memory I had to share. 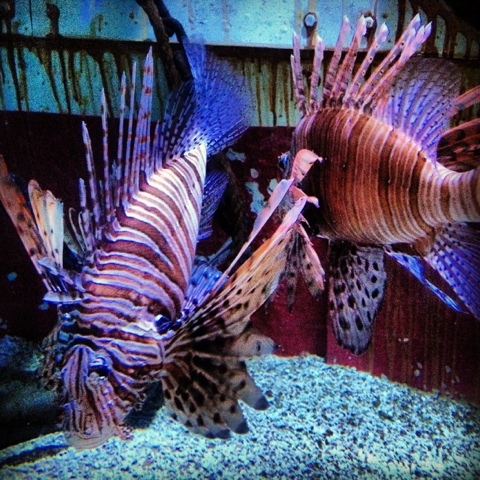 If you are a fan of the tv show New Girl, you probably recognize the lion fish. These beauties were so incredible to watch. In my opinion, the best thing about the Children’s Aquarium is the price. Admission is only $8 for adults, and $6 for kids 3-11 and seniors. 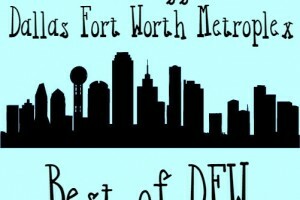 If you have a membership to the Dallas Zoo you get $2 off admission. An even better deal is the annual membership. For $20 ($15 for zoo members) you can buy an annual membership and visit any time. If you’ve checked out the prices on any of the other aquariums in town you know that price is unbeatable. **Holiday Gift Idea** A season pass would make a perfect gift for the fish loving child in your life. People (children included) remember experiences far more than material things. Do you remember what toy you got for Christmas at age 6? Probably not. 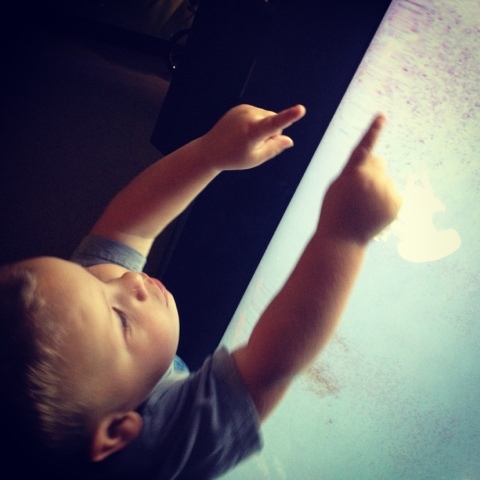 But I bet you remember a favorite visit to the zoo, aquarium, or special museum. 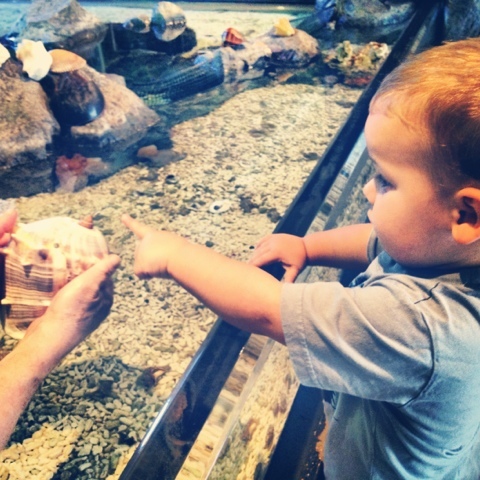 I would highly recommend the Children’s Aquarium for families with kids 1 and up. A visit takes 1-2 hours, depending on your child’s attention span. The Children’s Aquarium also hosts groups, birthday parties, overnight guests, and summer camps for kids from pre-k through 5th grade. Visit the Children’s Aquarium at Fair Park any day of the week from 9 am to 4:30 pm, except for Thanksgiving Day and Christmas. Click here to visit the Children’s Aquarium website for more information. 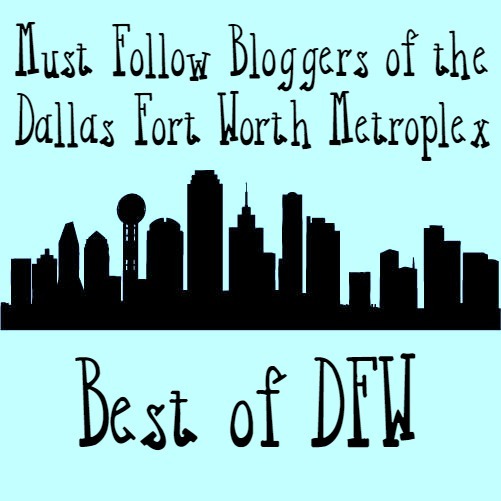 For more information about the Dallas Zoo visit their website here. 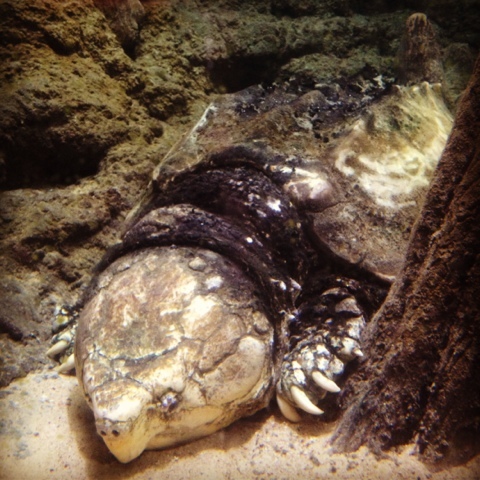 You can also follow the Zoo and Aquarium on Facebook, Twitter, and Instagram. 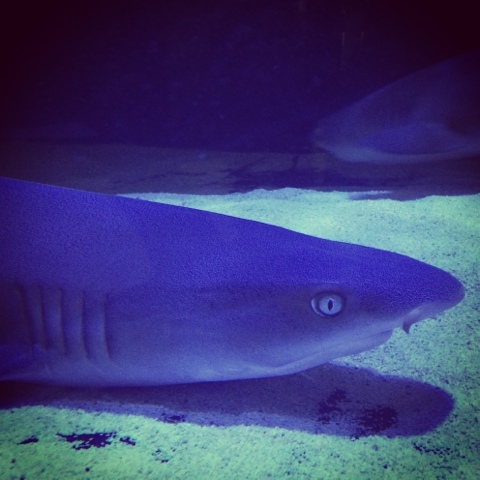 What is your favorite species to see at the aquarium? 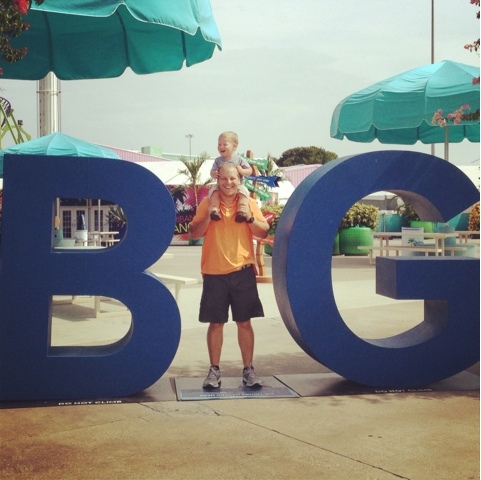 The State Fair of Texas Summer Adventure at Fair Park Rocks! 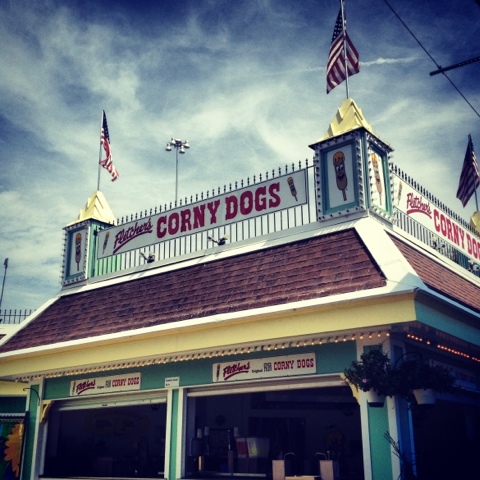 Did you know you can get a Fletcher’s Corny Dog in the summer? Until last week, I had no idea. I thought the illusive fried goodness only happened during the State Fair. 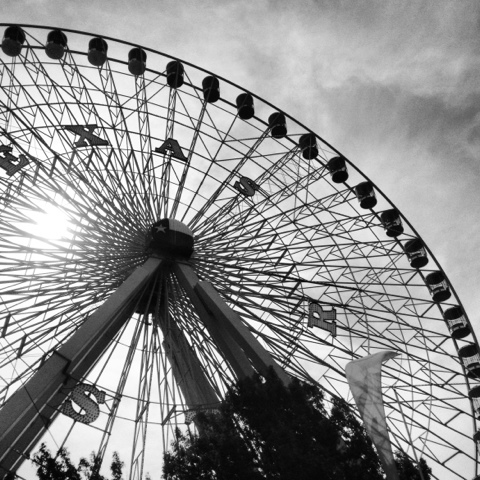 This summer for the first time, The State Fair of Texas Summer Adventure opened the fairgrounds up for the public all summer long. It’s not too late to visit, as tickets are half price and the gates are open daily until August 18th. This is not in any way a sponsored post. We just visited the Summer Adventure and thought it rocked, so I’m sharing it with you. 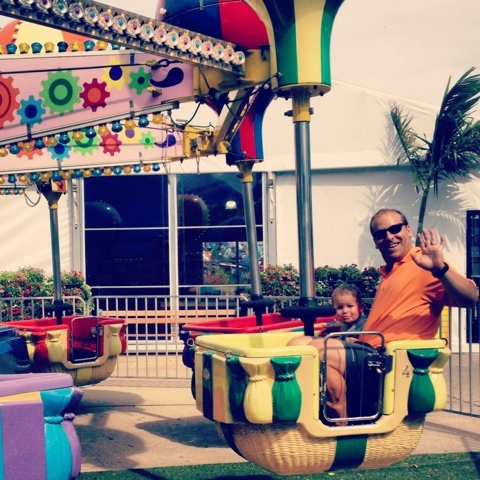 For one price you get all the rides you can squeeze in, and there are NO LINES. Seriously, we had the place to ourselves which was awesome. It opens at 10 am, so you can get there before the heat really sets in. For $14.95 you get a admission, a pass to ride everything as many times as you want, a bottle of water, AND admission to the Children’s Aquarium and the Texas Discovery Garden. That, my friends, is a ridiculous deal. I’m not sure how I missed this at the beginning of the summer, but I’m so glad we went. If they offer season passes next year, we are so in. The Bear had a blast. 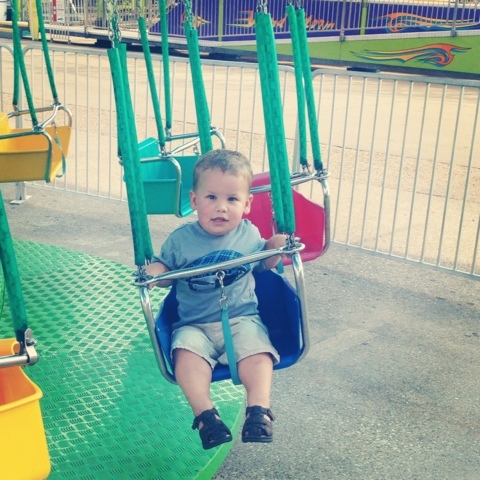 He rode his first ever fair ride, and loved it. See what I mean? No one else was there. It was AWESOME. The thing I don’t like about the actual State Fair is the crowds. We rode the carousel over and over, and were the only ones on it. I felt bad for the staff, but I’m sure it will get better next year. The Bear was able to ride quite a few of the attractions, but most of the kiddie rides have a 36 inch height requirement and our little shorty is 35.5 inches tall. 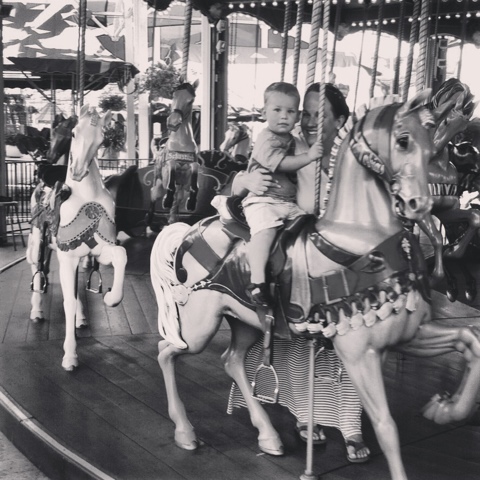 Next year he will be the perfect age for all the kiddie rides. There are plenty of options for big kids and adults as well. Not only do they have all the usual fair rides, they also have splash pads set up and a stationary surf wave you can ride if you want to get wet. They have shows going on all day as well, all included in the admission price. 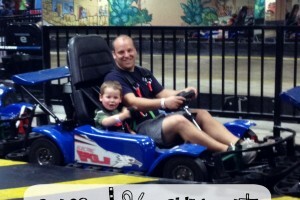 Jed and Bear loved the BMX bike show. Because of the notorious Texas heat, there are lots of indoor, air-conditioned options. 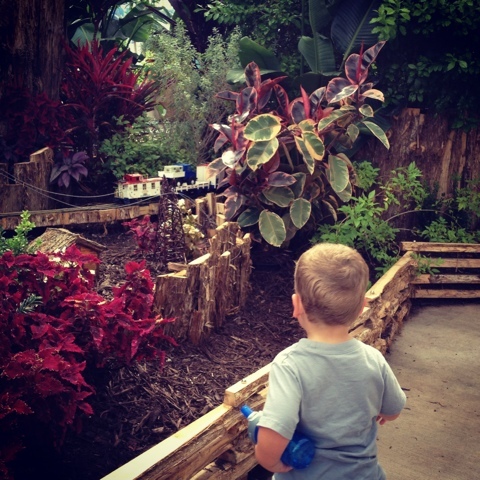 The building below is filled with gorgeous plants and a train exhibit that kept the Bear enthralled for over half an hour. That’s years in toddler time. It rivaled the Trains at Northpark and was seriously like a magical fairy land. I nursed the Pearl Girl while Bear chased the trains around. There is also a building dedicated to Lego building with tables for the kids and lots of seating for adults. We spent some time cooling off in there as well. 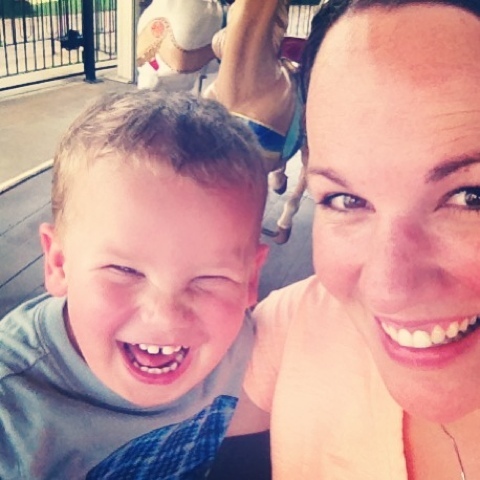 If you want to win the parent of the year award and end your summer with a bang, head to Fair Park. You can buy tickets online here and find more information. Our second baby is due at the end of April, and we are hoping and trying for a VBAC (vaginal birth after cesarean section). This is one of a series of posts about Trying for a VBAC. There are many reasons why we are heading this direction and I hope to share them with y’all over the next few months. You can read the Bear’s full birth story here to see what our first child’s birth entailed. If you read that story you will get a little glimpse into why we are now on this journey to VBAC and a normal birth. This process has been all consuming for me and this blog is my space to express the way I feel about the whole situation. Many folks have strong opinions about VBAC vs. repeat cesarean, and I hope that whatever your opinion might be you will respect mine. VBAC is not the right decision for every c-mama, and it doesn’t always work out no matter how you prepare. Our hope and prayer is that we can have the best birth possible for our little girl. Because we are trying for a VBAC and lots of people have lots of questions about what that entails, we’ll be live tweeting as much as we can during the birth. You can follow along on Twitter or on the Bare Feet on the Dashboard Facebook page for those updates when labor begins. You can read my other pregnancy 2.0 updates here, and read all my pregnancy posts here. One thing I have learned on this journey is that all hospitals are not created equal. Did you know you can find the c-section and VBAC rates for most hospitals online? It’s true. I so wish that I had known before what I know now. I would have chosen a different hospital and OB for my first birth for sure. I really like my first OB as a person, but do not like that she did #3,4,7, and 8 of the “Top Ten Signs Your Doctor Is Planning to Perform an Unnecessary C-Section On You.” The hospital where I gave birth to the Bear also has one of the higher c-section rates in our area at 44.8%. That means I only had about a 55% chance of normal birth at that hospital! Scary. Whether you are a 1st time mama or a mama considering a VBAC, please take the time to look into your hospital’s c-section rate. The World Health Organization (WHO) recommends no more than a 15% c-section rate for hospitals, meaning that c-sections are used only in cases where they are truly needed and interventions that can lead to c-sections are eliminated. Unfortunately in most of the Southern U.S. (Texas included), NO hospitals have c-section rates in the healthy zone. When we first decided to try for a VBAC, I looked into hospitals and birth centers in our area. Jed was pretty nervous about the idea of a home birth, so we decided not to go that route. I called several birth centers in our area, but the one I really wanted doesn’t do 1st time VBACs. If we get our VBAC this time around, I could birth there next time. They did recommend the OB I chose because she is a big supporter of natural birth and VBAC. She also practices at a hospital with one of the better VBAC rates in our area. This is HUGE. In the whole DFW area there are only 4 OBs who are known to be pro-VBAC – Dr. Lawson (my doc), Dr. Cummings (Denton), Dr. Downey (Richardson), and Dr. Weinstein (Frisco). The hospitals where each of them practice have significantly higher VBAC rates than all the others. So, why is it such a big deal to find a VBAC friendly hospital? I want a hospital where the nursing staff is familiar with VBAC, and knows that it is safe and what protocols apply. A staff that is not familiar with VBAC can sabotage your birth without meaning to, because they don’t know how a VBAC works. I’ve read so many stories through the International Cesarean Awareness Network about women who have had no choice but to show up at the hospital as late in labor as possible so they won’t be forced into a repeat c-section. I did not want to end up in that situation. At Medical City (my former hospital), only 15-16 VBACs are performed every YEAR. That means about 1 VBAC happens every month, sometimes 2 per month. With those numbers, it is highly likely that some nursing staff have never seen a successful VBAC. At Baylor (my new hospital) over 60 successful VBACs happen every year, which means they are seeing 1 per week, sometimes more. That greatly increases the chances that the nursing staff will be familiar and comfortable with the VBAC process. Medical City’s VBAC Rate: 2.82% They do about 15-16 VBACs per YEAR at Medical City. That’s about 1 per month, 2 a few months. Baylor Medical Center’s Cesarean Rate: 38.6% Sadly, this is one of the lower rates in our area that is covered by our insurance. Baylor Medical Center’s VBAC Rate: 10.74% They do 60+ VBAC births every year, averaging out to one per week, with 2 a few weeks. VBAC Rates by State – Find your hospital. Cesarean Rates by State – Find your hospital. How does your hospital rank with c-sections and VBACs? 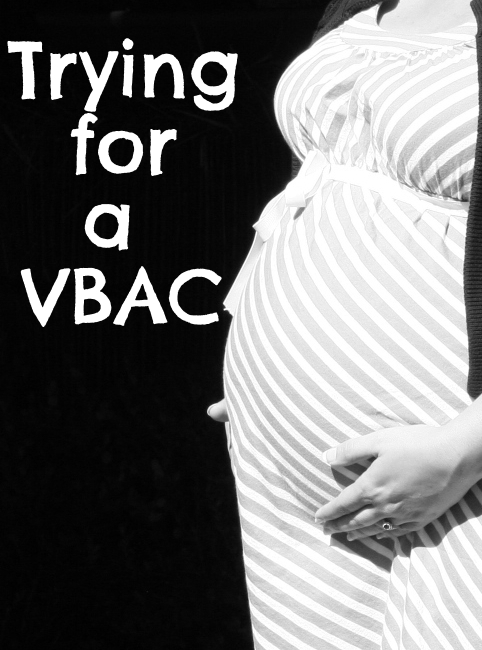 You can read all of my posts about Trying for a VBAC here.